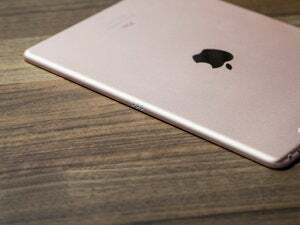 Only the 9.7-inch iPad Pro has an auto-adjusting True Tone screen. But you can mimic the effect on any iOS 9.3 device, with Night Shift. Right now, the 9.7-inch iPad Pro is Apple’s favorite child. How else can you explain the advantages Apple gave it over the 12.9-inch iPad Pro released just months earlier? Only the Lil Pro can shoot 4K video and 12-megapixel stills, not the Big Pro. The Lil Pro is the only iPad to have a flash—it’s even on both cameras, a real flash on the rear camera and a Retina Flash on the front that works by lighting up your screen. And of course it’s the only iPad to have a True Tone display. But guess what? Cool as True Tone is, you don’t really need it, not enough to pay hundreds for a new iPad, anyway. 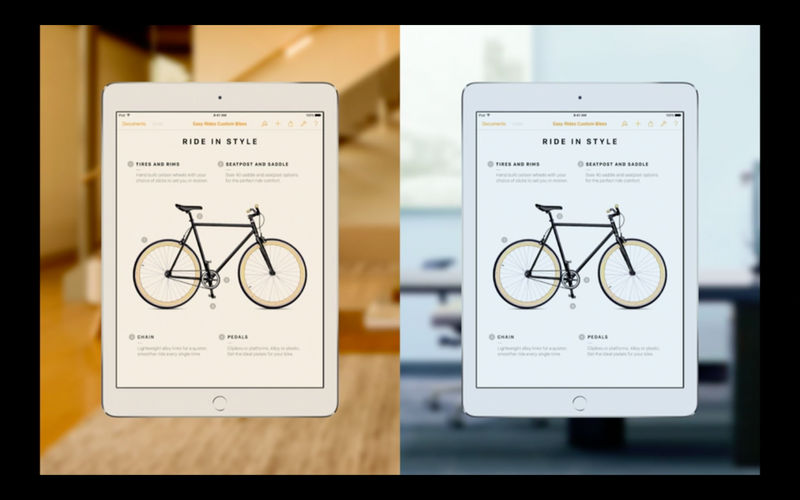 In fact, if you use iOS 9.3’s new Night Shift feature with a light touch and a 24-hour schedule, you can get a True Tone-esque effect on your existing iPad or iPhone without spending a penny. True Tone attempts to match the color cast of your display to the ambient light in the room. Every iOS device has ambient light sensors (which help drive the Auto Brightness feature), but the Lil Pro’s sensors are unique because they can detect the color temperature as well as the brightness. If your room is lit by cool flourescent lights, the iPad’s screen will stay closer to the blue end of the spectrum, and when you move to the warmer light of an incandescent bulb, the screen will automatically adjust toward the yellow side. The idea is that by compensating for small changes in the ambient lighting, your display will look more consistent from place to place. Believe it or not, True Tone's auto-adjusting is aimed at achieving a more consistent look. True Tone absolutely works as advertised, but that hasn’t convinced me that I really need it. Truthfully, the only time I’m aware that any iPad’s screen is so blue is when I’m trying to take a photo of it with the screen lit up, and the white bezel around the iPad display winds up looking yellow because the blue screen is throwing off the photo’s white balance. But my eyes just aren’t attuned to color temperature in normal, everyday use—I would never look at a screen and think “too yellow” or “too blue” unless it was way, way off. I’m too busy interacting with the content on that screen to notice, but everyone is different and your mileage may vary. Unless you have the 9.7-inch iPad Pro, your iPhone or iPad’s ambient light sensors can’t tell blue light from yellow light, and so you don’t have the True Tone feature. 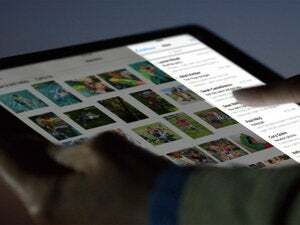 But any device that can run iOS 9.3 can use the new Night Shift feature, which makes a similar adjustment for a different reason. Night Shift, when enabled, reduces the amount of blue in your display at night. 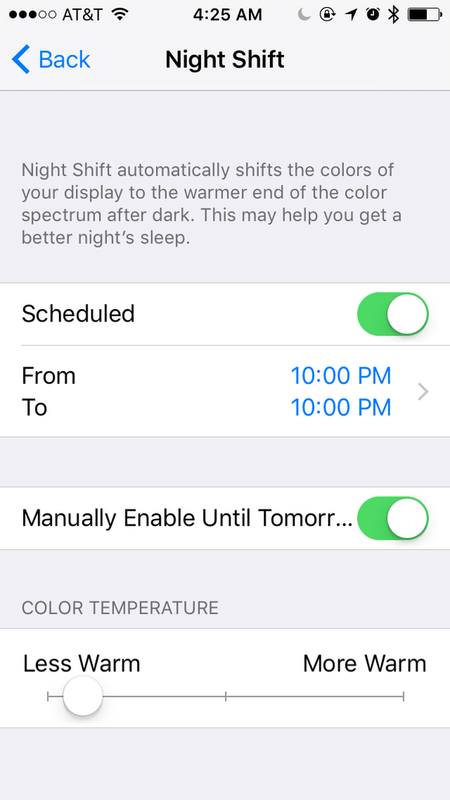 Based on a schedule, it’ll shift the display’s color temperature toward the yellow end of the spectrum from after sundown until the next morning. Apple says this is because blue light can affect your internal clock, tricking your brain into thinking it’s daylight when it’s night, which could make it tougher to fall asleep. 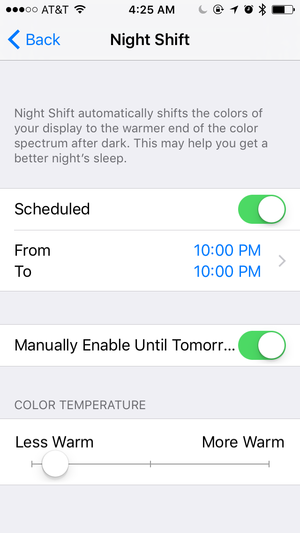 You'll find Night Shift in Settings > Display, on any device running iOS 9.3. Well, that’s the idea anyway—but the research isn’t totally convincing that the exact spectrum of blue light emitted by a screen really affects melotonin production all that much. But everyone’s a little different, so you may still find it helpful, even if it’s just a placebo. And unlike True Tone, Night Shift is adjustable. Since the effect isn’t driven by sensors, it doesn’t adjust automatically to the color of light in your room, but you can tweak it yourself, setting the slider in Settings > Displays to where you think it looks best. I think anything above about 25 percent starts to look too yellow—go ahead, slide it all the way to the right if you want you screen to look so golden it’s like you’re looking through beer goggles. Night Shift is also on a schedule, so you could experiment with leaving it on just a little bit, 24 hours a day, for a kind of “poor man’s True Tone” effect. What do you think? Have you been using Night Shift and enjoying it? 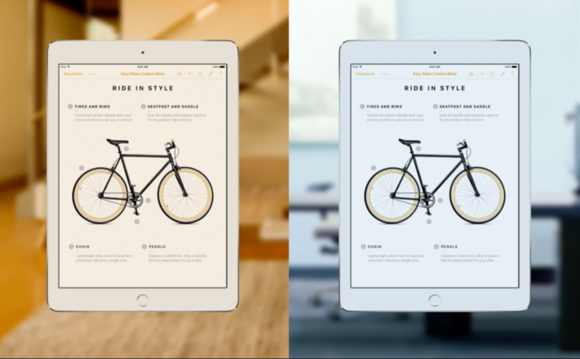 Would you buy a new iPad just for True Tone? Are you eager for Apple to bring True Tone to more devices? We’d love to hear your thoughts in the comments.